Shoes off if you love Tottenham! I'm still chuckling at that one. Sounds like a great night, well done to all. We should have played in lilywhite though. The first team played in that grey and black at the Emirates this season. I hope this isn't going to happen anymore when playing Arasenal away ... When are you next on the FC podcast Windy? They'll be buzzing in this week's podcast. And deservedly so. Brilliant. 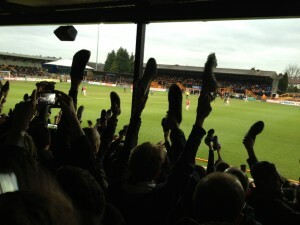 Shoes off if you love Tottenham! I'm still chuckling at that one. Sounds like a great night, well done to all. We should have played in lilywhite though. The first team played in that grey and black at the Emirates this season. I hope this isn't going to happen anymore when playing Arsenal away ... When are you next on the FC podcast Windy? They'll be buzzing in this week's podcast. And deservedly so. Brilliant.